EPT pregnancy test is the early home pregnancy test kit and is designed to make it easy for you to find out if you are pregnant in the privacy of your own home. This test kit is 99% accurate for detecting your pregnancy hormones. But, some pregnant women do not have noticeable amounts of pregnancy hormone in their urine on the first day of the missed period or they may have miscalculated the first day of their periods. EPT pregnancy test kit is very easy to use, read and also accurate. You can use this kit the day you miss your period. This kit can measure up to 40 mIU of hCG. There are two types of home pregnancy tests that are commonly marked as Error Proof Tests. One is EPT certainly digital home pregnancy test and the other is EPT +/- home pregnancy test. EPT certainly digital home pregnancy test kit offers unmistakable results with a digital readout. It is very easy to use and you can use it during any time of the day. This test kit is 99% accurate from the day you miss your periods. If you do not have detectable HCG levels in your urine, then the test can show false results. During these times, wait for some more days and take the test again. 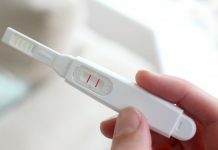 EPT +/- home pregnancy test is a one step test kit, but the instructions are most similar to those for the EPT certainty test. This test kit is also 99% accurate from as soon as the first day of your missed period. You need to wait for 2 min to read the result. You will observe a line in the square window and it is the indicator to show that you have done the test correctly. Make sure that you read the result within 10 minutes after performing the test. For pregnant woman: It displays a ‘+’ sign in the round window indicating that you are pregnant. The lines that make up the plus sign can be different shades of blue. For non pregnant woman: It displays a ‘-’ sign in the round window indicating that you are not pregnant. After getting the negative result, if your period does not come within a week, then repeat the test. Still if you get the result as negative and your menstrual period is not yet started, consult your doctor. Previous articleBenefits And Risks Associated With Dilation And Curettage!